Since the Library of Congress opened its extraordinary Flickr site with an amazing visual archive of photos that includes 1930s-40s in Color and News in the 1910s, users of the online photo-sharing site have responded with the rhetoric of community and contentiousness that is common in Internet culture. 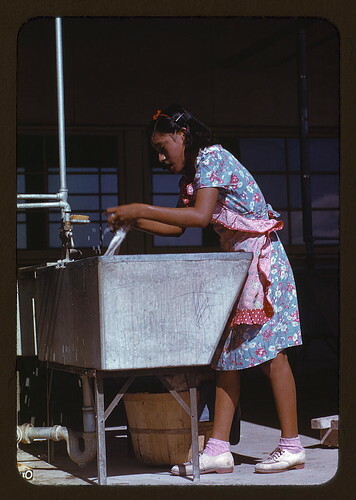 For example, in the image above, visitors to the site debate about whether or not this photograph of a female aircraft worker shows an icon of the lived experience of labor or a photo shoot with a staged model. Commenters debate about the authenticity of the image, much as Henry Jenkins describes the disputes among "spoilers" who compete to reveal the outcomes of reality television broadcasts in advance or piece together clues to reveal political images as bogus. Digital Media Projects Coordinator at the LOC's Office of Strategic Initiatives Laura Graham, who is interviewed in my upcoming book from MIT Press, sent me the Flickr link and reported that many interested citizens are writing in to correct and supply useful cataloging information on the images, which are also likely to be reused for creative and educational purposes, since they lack copyright restrictions and are part of the public domain, like the classic Dorothea Lange image "Migrant Mother," which graces the cover of fellow rhetorician and visual culture blogger John Lucaites' current book. Obvious question are raised, however, by the use of a commercial site with proprietary software that requires those who wish to publicly comment to click a user agreement that is part of a corporate legal contract by a government agency that presents and preserves our common cultural heritage. In Flickr's defense, they've had remarkably good press about their corporate transparency in the open source blogosphere and have also worked closely with Creative Commons to encourage users of their sites to explore alternatives to the current copyright regime.